How do you read your news? Online at the PC? On your mobile phone? Through your twitter or facebook feed? Having a slow start into the day over a good cup of tea while my family was still in bed (Easter vacation in Germany), I browsed through the printed edition of DIE ZEIT, a weekly newspaper here in Germany. According to “The Society of News Design” they share the title of “World’s best designed newspaper” with the “New York Times” and “Het Parool”. The layout of the article that caught my attention today is just outstanding. The same content online is just plain text – all the beauty of layout stripped down to basics. A shout-out to my beloved paper industry: without real paper a lot of beauty is lost. Keep the good work up! The layout is not just beautiful by iteself, it boils down the story into a visual. 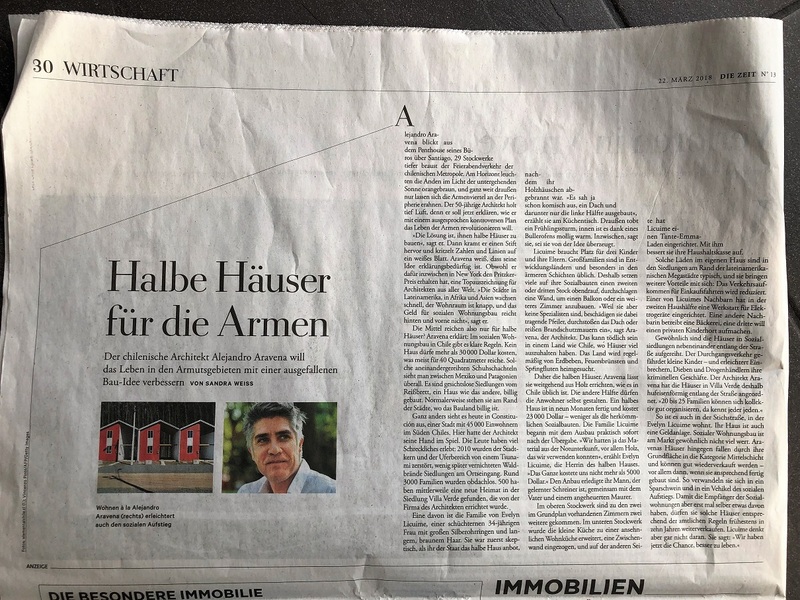 For the non-german speakers: The title reads “building half-houses for the poor”, and explains a brilliant architectural approach by Chilean architect Alejandro Aravena. Aravena, a 2016 laureate of the Pritzker architecture prize, design expandable, affordable houses for the poor. Chilean legislation requires “social” houses to cost no more than 30.000 dollar. The typical result of this are very small houses, “favela-style”, with approx. 40 m2. In Constitución, a town in South Chile that suffered heavily from tsunamis and earthquakes, the architects designed the social housing units as half of a good house instead of a complete, but small one. The house is intentionally “incomplete”, or rather built for growth and affordability. It is constructed with the purpose for residents to double the floor area of the house to 80 square meters. What I love about this project is the design approach taken. Listen to Alejandro Aravena explaining this vividly in this must-see TED-talk, must-see esepcially for any design thinking enthusiast. The key questions remains how to built in a humane, robust, affordable manner. Aravena decided to involve the “customer”, the people living in the favela, in the design project (check out the paper prototypes created in the above video). Aravena used multiple iterations to learn. Do not think this is an academic problem. The customer threatened to go on hunger strike if the solution was not adequate. It provides a solid foundation that can withstand future natural disasters much better. It is built within the cost constraint. It is designed to be expandable – with the skill of the residents. Many accidents happen and houses collapse when an additional floor is added, or a wall is removed, by its residents. Aravena’s concept provides a robust foundation to expand one – without compromising the house’s structure. First and foremost, I love the idea of flexible living that adusts to the needs of the residents. Will your house still fit to your needs once the kids move out, or when you can’t climb stairs anymore? Would you rather move, or “adjust” your home to your needs? Secondly, I believe there’s a lesson also for the software world in uncertain times of digital revolution and blurring industry boundaries. Will you still earn the majority of your profit in the industry you are currently in? I love the story of Marvinpac, a packaging company in the Czech Republic. They grow by 50% each year. You’ll need to build that into your transformation roadmap design. Finally, I would love to see more of this type of design thinking with empathy. Talking to, and co-designing with the real end-user or customer – not the super-user, or in this example the city of Constitución. So, how about you: Would you leave in a half house?